"A refreshing appetizer for the summer, my family loved this so much they ate more than a serving each. Also great for those who love the flavor of caprese but aren't huge fans of tomatoes." Trim basil leaves into small circles about 1 inch in diameter. 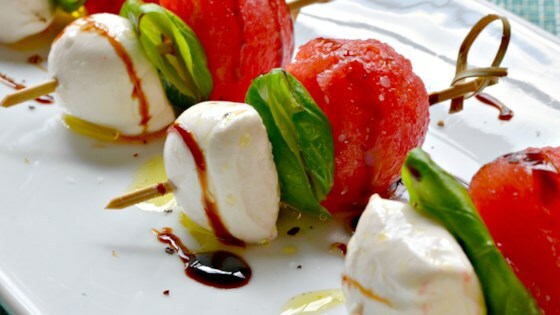 Thread watermelon and mozzarella cheese on toothpicks, sandwiching a basil leaf in between. Arrange on a serving plate. Pour olive oil and balsamic vinegar over toothpicks. Sprinkle salt and black pepper on top. Watermelon + Caprese = Summer Refreshment! Liked it. Refreshing. I used feta cubes. Next time would ensure feta bigger so it did not flake off the tooth pick. Everyone loved it. Great new take an old favorite for a summer BBQ.